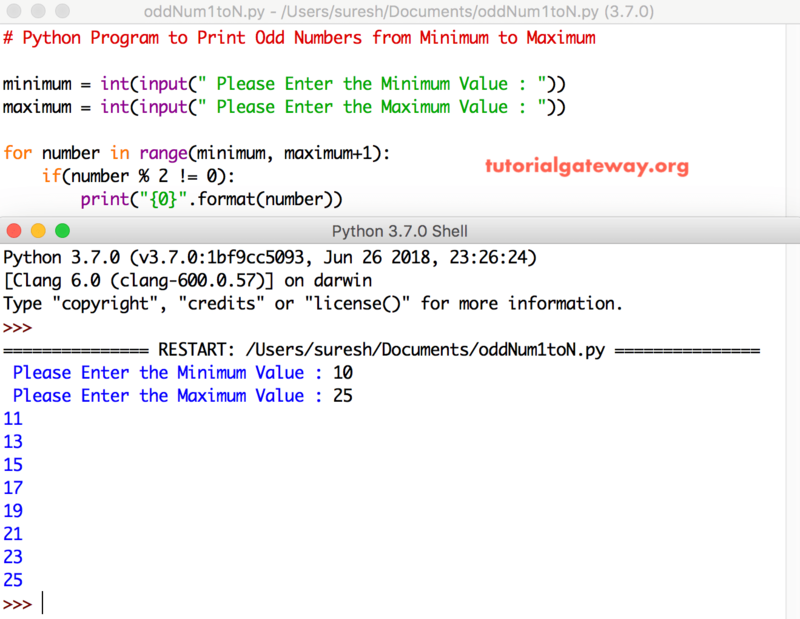 In this article we will show you, How to write a Python Program to Print Odd Numbers from 1 to N using While Loop, and For Loop with example. TIP: I suggest you to refer Odd or Even Program article to understand the logic behind Python Odd numbers. This Python program allows the user to enter the maximum limit value. Next, it is going to print odd numbers from 1 to user entered maximum limit value. In this example, For Loop will make sure that the odd numbers are between 1 and maximum limit value. This code is same as above, but we altered for loop to eliminate If block. If you observe closely, we started the range from 1 and we used the counter value as 2. It means, for the first iteration number = 1, second iteration number = 3 (not 2) so on. In this python print odd numbers program, we just replaced the For Loop with While Loop. This python print odd numbers program allows user to enter Minimum and maximum value. Next, it will print odd numbers between Minimum and maximum value.